This article will help you get even a non-fishing family out fishing and ACTUALLY ENJOY IT. You think its a secret but its not, your family knows that you dread family vacations to amazing places. It is not because you don't love your family but because you feel trapped on a vacation so near to the water with no way to access it in the way that you want. You want to enjoy your family and your vacation, so this may be a good compromise. Vincent will get you up and running on pier fishing in minutes. Crystal Pier Bait & Tackle is located on the Pacific Beach pier. It not only has fishing tackle but it also has a number of rare to find items that are uniquely San Diego. Remember we talked about that whole compromise thing, well this is a good time to hit that happy medium. We know you would rather just get out and start fishing, but this place has a few things your family members might appreciate browsing. So take your time here. Signs your family is going to want to bring home to show they went to the beach. I walked over to the pier after having a coffee at Pacific Bean Coffee. But you may also want to check out ___ . They have AMAZING breakfast burritos and there is usually a line, I hate lines too, so maybe while everyone waits in line for their coveted breakfast head down to Crystal Bait & Tackle to get everyone's fishing tackle ready. Don't worry they will be happy to wait in the line for the "Most Famous Burrito In Town" and you will get brownie points right before fishing. No fishing license is needed which makes this a great place to take the whole family. Fishing license for California non-residents are $15/person at the moment, this will probably continue to go up. If you want to take your whole family fishing and they are not a fishing family (See Surviving A Non Fishing Family), this is the way to go. Your rental not only includes a rod, but also bait, tackle and a short briefing on local fishing conditions. 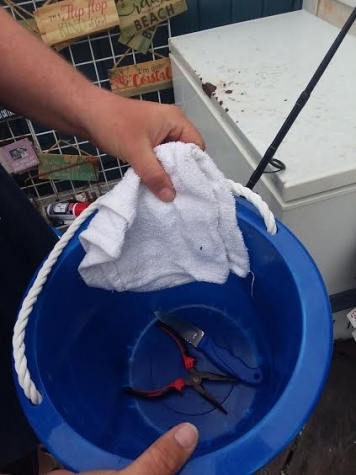 This bucket contains the basic fishing supplies you will need. A pair of pliers , a knife for cutting bait, and a towel for cleaning your hands or maybe helping even the most squeamish member of your family grab a fish "with their own hands". If you have your own gear you may want to try a little bit of local style fishing. Buy some shrimp or sabikis from the local pier and catch some Mackerel. You may want to try out a pier technique called slidebaiting. Below local fisherman Brandon Hernandez shows how to go about doing this. Below Brandon Hernandez casts an 8 oz pyramid sinker out on his Shimano Torium packed with braided fishing line and a 40Lb monofilament topshot. Below Brandon explains how he rigs for slidebaiting.